iPhone mobile application: This is one of the most popular smartphones to be used in recent years. Our team of experts at Scriptonova has a unique understanding of the applications that would be fitting for this mobile phone and we assure you that you will receive amazing applications for this mobile phone. In fact, we would like to offer you a well identified approach to developing applications for this mobile phone. Blackberry mobile application: This is a powerful tool used in the market today and has being reigning for a long time now. We have a powerful history in mobile application development for Blackberry used in business. We would be glad to help develop applications suitable for this smartphone because we know how important your business is for you. Feel free to contact our knowledgeable team of consultants for your mobile application requirement and we will help you create a robust integration as well as intuitive user interface along with custom lifestyle applications. iPad mobile application: We have developed several applications on Apple’s mobile operating system powering the iPad, iPod as well as the iPhone. However, we suggest that you should have a separate mobile application development for the iPad because it has a bigger display surface. Although the iPad can actually run designs that are created for smaller-screened phones, it may prove beneficial for your business to have an enhanced version that offers higher quality images. Call us now for your requirement and we will develop an application through which you can reach a larger and different audience while improving user experience when it comes to media and video. Android mobile application: We at Scriptonova have made successful attempts to bring about a unique approach to the Android mobile application development market with our detailed applications. We create applications that befit every Android device and we also add a business perspective to every project that we undertake. For us it is important to understand how the application will enhance your business and having understood that we incorporate the goals into our designs. Windows mobile application: We understand that Windows Phone 7 has just joined the platform for smartphones but for us it is the zeal to develop new applications that give us the drive to work with newer ideas too. The Windows Phone 7 is quickly grasping its position in the smartphones market and we at Scriptonova are already helping our clients with mobile application development for this smartphone. Call us now for a spectacular user experience with our interface designs. 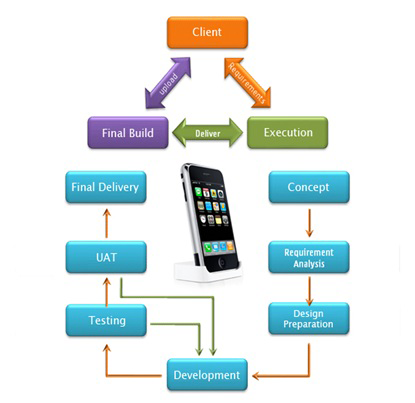 We have senior level architects who will help with your mobile application development. Call us for free consultation and we will be glad to discuss your requirements with you. We always make sure to put our best teams at work for our clients.